Traveling Tech Guy Blog: Why Did I Buy a PS2? Why Did I Buy a PS2? There are many reasons for the time gaps between my posts. Sometimes it's the travel. Other times it's lack of time or extreme case of jet lag. Then again, there are always times when I lose the urge to write (I either feel like writing 7 posts in a row, or just kick back and watch a movie). But this last delay can be attributed to my new/old addiction - the Sony PlayStation 2. A couple of years back, my good friend Adi loaned me his PS2 along with about 200 games for a couple of months. Needless to say, my productivity dropped to near 0 during that time. He, of course, needed to concentrate on his exams, so he chose to get me addicted instead . Over the years, Adi kept loaning me his system every time he needed to concentrate on something. Since then, PC games became better, I even have an Xbox 360 - which is definitely spiffier and more modern, but the PS2 still had a warm place in my heart. 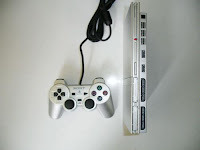 A year ago, Sony released a newer version of the PS2 dubbed "Slim". And slim it is - roughly the size of a book, extremely thin and light, available in black or silver, it has a built in network card (a feature you had to pay extra for in the original PS2), a low price (get it new on Amazon for $129 or in other stores, bundled with some games, or much lower on eBay) and best of all - it runs all the thousands of PS2 and PS1 games out there. I scored an almost-new silver one on eBay for $70. I also scored a bunch of old games as well for as low as $0.01 (shipping was much higher than 3 games put together ). I came home from Vegas and it was there in my mail box. 5 minutes later I was kicking people in Tekken 4 - the best fighting series ever. Other than games, try to get at least an 8mb memory card ($3/20 used/new) if you intend to save your plays. So now I'm hooked. Right now I'm trying to get Sam Fisher out of the Georgian Defense Ministry in the good ol' Splinter Cell. I may actually take the system on the road with me, since it's so compact and can easily be connected to any TV (will that make me an extreme geek?). My son just got one too (yes, I know, we are very much "behind" intechnology). He liked "God of War" which I bought for him. What are the 3 "must have" games? If possible, would be nice to have less visible violence. Why don't they have something like "Rayman" for PS? You can look for the "Sonic the hedgehog" series, "Ratchet and Clank" and "Jax and Dexter" (closer to Rayman). Also try some sports games. What are lovely this his comment blog and this site is very nice.